Three-dimensional learning represents a significant shift in science education. The NGSS* Framework brings together science and engineering practices, disciplinary core ideas, and crosscutting concepts. Miller & Levine Biology integrates three-dimensional learning seamlessly into instruction, activities, and assessment. This gives students a more meaningful understanding of the life sciences, and it allows them to use the same practices as scientists and engineers. It will help them better achieve all NGSS performance expectations. Crosscutting Concepts are woven throughout Miller & Levine Biology to help students develop, understand and connect the disciplinary core ideas in meaningful ways. Students explain phenomena by simultaneously applying crosscutting concepts, such as patterns, cause and effect, or stability and change. 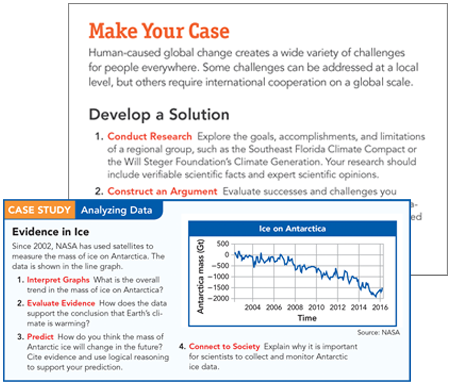 Crosscutting concepts are made explicit in lessons, videos, and chapter assessments. 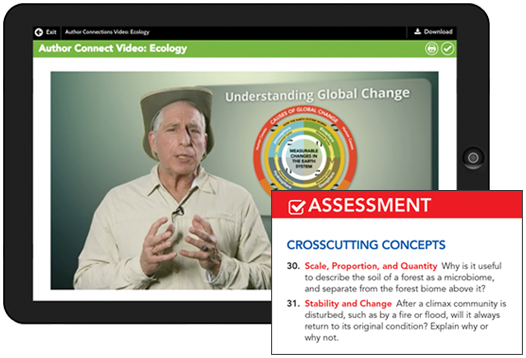 Author videos introduce students to crosscutting concepts using examples from the unit. The CCC’s are identified in detail in teacher edition to aide in planning. 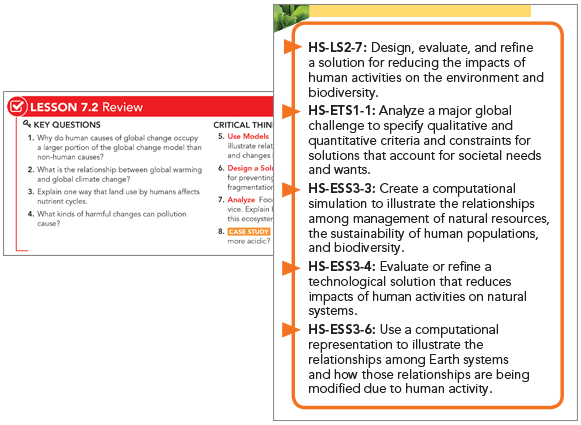 The Curriculum blends scientific and engineering practices and crosscutting concepts with Disciplinary Core ideas. Students gain a deeper understanding of the DCIs as they apply SEPs and CCCs. The DCIs give each lesson precise focus. Core ideas are organized into all four content domains: life; physical; earth and space; and engineering, technology, and applications of science. Lesson activities, such as Quick Labs, Data Analysis, and Lesson Review, put the DCIs into action.